“Finger millet” a 4000 Years old cereal, a smart crop of Ethiopian highland introduced to India. An amazing seed which is a natural sapid relaxant that can be roasted with ghee, a sattvic food item that balances Kapha, acts as a lubrication to the mind and the body, structures and governs the balance of body fluid. aline and gluten-free, with a dry and light quality, Can be purchased in stores in fine pinky flour form and as ragi vermicelli that can be prepared as dosa, idli, porridge, pudding, cakes, upma, and biryani or with vegetable stews. Ragi is processed by milling, malting, fermentation, popping & decertification. Vermicelli, noodles, pasta, Indian sweets mixes, papads, soups, and bakery products out of ragi are emerging. 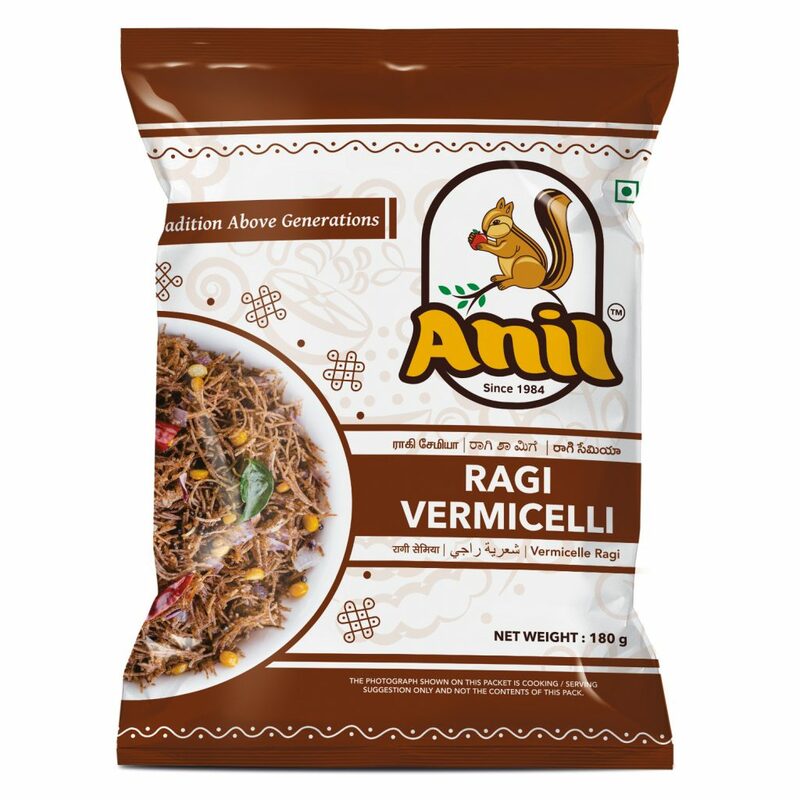 The best brands of ragi flour with traditional qualities are available in the market, brands like Anil vermicelli and flours are considered to be the most trusted for their taste and quality. Ragi has attained the superfood status with awareness of its health benefits and nutritious values, insisted by nutritionists and doctors for a healthy living and bringing down the burden of malnutrition. Research validates the goodness of millets. In 2010, a study published in the Pathophysiology journal said that eating ragi could help bring down blood glucose in diabetics. A research paper published in the Journal of Agricultural and Food Chemistry confirmed that all millets are rich sources of antioxidants, while another study in Nutrition Research concluded that millets may be useful in preventing cardiovascular disease. The right cooking technique and a good recipe can lift any ingredient, “It is easy to include millets in the diet as they are very versatile, millet pancakes are the best choice for a simple breakfast, can be cooked like rice. Of all the cereals and millets, finger millet has the highest amount of calcium, potassium, high dietary fiber, minerals, and sulfur-containing amino acids compared to rice. Processed by milling, malting, fermentation, popping & decertification. Vermicelli, noodles, pasta, Indian sweets mixes, papads, soups, and bakery products from ragi are emerging. With regard to the protein (6-8%) and fat (1-2%), it is comparable to rice and with respect to mineral and micronutrient contents it is superior to rice and wheat. Nutritionally, it has a high content of calcium (344 mg/100g), dietary fiber (15-20%) and phenolic compounds (0.3–3%). This minor millet contains important amino acids, isoleucine, and leucine, methionine and phenylalanine which are deficient in other starchy meals. It is also known for several health benefits such as anti-diabetic, antitumorigenic, atherosclerogenic effects, antioxidant, which are mainly attributed due to its polyphenol and dietary fiber contents. Being indigenous minor millet it is used in the preparation of various foods both in natural and malted forms. Grains of this millet is converted into flours for preparation of products like biscuits, roti, bread, noodles, and other snacks, besides this, it is also used as a nourishing food for infants when malted and is regarded as wholesome food for diabetic’s patients.